Riverfront property in the neighborhood. Do you make New Year's resolutions? Tom explained the only resolution he ever made years ago was to quit smoking which lasted for eight months when he purchased a pack of cigarettes at the Minnesota State Fair the following summer. He no longer smokes. My resolutions of the past were always the same, common with many women and men; lose weight, exercise more or smarter. I always worked out but never understood why I didn't lose 10, 20 pounds or more as shown in yesterday's photo. Now summer in Fiji, more and more flowers have begun to bloom. I never understood why working out 90 minutes at least five times a week had no apparent bearing on improving my health other than strength and cardiovascular endurance, until 2011 when I changed to my current way of eating. I'd already lost about 50 pounds in 2004 and kept it off for seven years through a very difficult-to-follow, low calorie, low fat diet. But, why didn't my blood lipids improve on a low calorie, low fat 1400 calorie a day diet? It was only after I began this low carb, high fat, grain, sugar and starch free way of eating in August, 2011 that my lipids greatly improved along with my health. Pretty blooms in the neighborhood on one of our walks on few less rainy day. From 2011 on, I no longer had to count calories and monitor how much I consumed by eating only to satiety. My ravenous hunger was gone along with years of pain and disability, enabling us to travel. Basically, I eat food in its natural state; grass fed, free range, organic without grains, sugar, starch and chemicals. (Although I'm able to consume small amounts of full fat dairy; quality cheeses, real cream, sour cream, cream cheese and, yogurt without additives, sugar and fruit). Modern house in the neighborhood with a name of its own. With Tom following along in this way of eating, now at his lowest weight in many years, not smoking and feeling healthier than ever, he doesn't feel compelled to adopt any new resolutions to tackle. He'll eat what he likes on the upcoming cruise and once we settle again, he'll return to our healthy diet. (I maintain each of my food restrictions while on cruises with the help of the usual conscientious chef and other staff, never experiencing too many obstacles). As a result, we can't think of a lot of resolutions we feel compelled to make in this new year. Sure, we all have personality flaws and areas in our emotional lives that could prompt thoughts of a resolutions. Several times we've walked along to road beside the local golf course. When one is happy and enjoying good health, its difficult to muster motivation to make any major life changes. Are we cocky? Not necessarily. We're simply content. 3. We have choices we can make for our own happiness which others may perceive as selfish and that's about them, not us. 5. Physical signs of aging can be minimized with good health but gravity is more powerful than anything we may try to do in an attempt to defray it, so accept it with grace and dignity. One of the green on the golf course. 6. Avoid disharmony. Baloney...that "stuffing it" is bad for one's psyche. Doing so, gives us an opportunity to think over the situation later in a calm manner and if one can put aside ego and apologize, accept and rewarm the relationship, harmony and happiness is retained. No snipping! We'd bite our tongues before being snippy at one another. Ignore grumpiness rather than get involved in it. 7. Avoid stressful situations by planning ahead as much as possible. When unexpected situations arise, breathe, think and come up with an mutually agreeable solution. 8. Don't worry in the middle of the night. Everything is easier during the day when we have an opportunity to work on a solution. (Its only been in the last year that I've learned to do this and am still working on it after considerable improvement). 9. Take risks and stretch ourselves while making safety and health the first priority. Fear is good when it protects us, not so good when its irrational and immobilizes us. 10. Appreciate, be humble, thank your God or higher power every day. Pray, as well as take action, for the things we want to achieve. The road along the golf course. The above may not apply to everyone although we've found these ten points to highly contribute to our sense of well being making us grateful and fulfilled, while making these the best years of our lives. None of the above has anything to do with traveling and exploring the world and everything to do with exploring and developing our own personal growth and horizons. We're never too old to grow and learn. Raging sea with heavy mist on this date on year ago on the Big Island of Hawai'i. For more photos, please click here. Its New Year's Eve in the South Pacific....A happy, healthy New Year to everyone!...A long ago, goofy photo! Hahahaha! We sure didn't look very healthy here on New Year's Eve in 1999. We were both overweight (40 pounds each heavier than we are now), on multiple medications and looked less healthy than we do today. It goes to show that our way of eating coupled with a low stress, happy life can contribute to one's state of health. For many years in our old lives we hosted New Year's Eve parties often with a special theme requiring a little preparation for those so inclined. If a guest preferred to come "as is" there was no ribbing, only good cheer that they'd decided to come out on what was often a very cold, below zero degrees F, (-18C) night in Minnesota. On New Year's Eve in 1999/2000, when much of the world was terrified something bad was about to occur at the turn of the hands of the clock to midnight, we had our last New Year's Eve party with a change of the millennium theme. 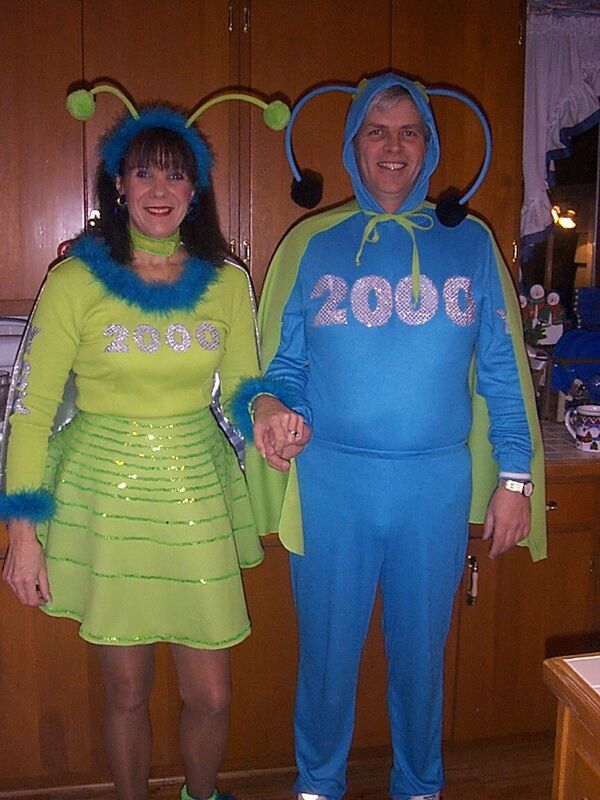 Tom and I dressed as "bugs," computer bugs" specifically as shown in this photo, when many techies along with the general population worried that computers worldwide would crash. Remember that? Photo of us two months ago today, slimmer, healthier and happier than ever. Sure, we have a few more wrinkles than 16 years ago but who cares when we're enjoying our lives and good health? Sadly, that particular party, the first time ever, was a total bust. The weather was bad in Minnesota, the roads icy and without a doubt, a certain degree of fear left many preferring to stay home. Only six die-hard party goers attempted the long drive to our home. We celebrated together, ending the night early so our guests could get home before the weather and the traffic with impaired drivers got any worse. Over the next 11 New Year's Eves, we didn't have a big party instead getting together with our fabulous neighbors, greatly reducing the risk of getting home on a bad night. Having left Minnesota before New Year's Eve 2012, spending it in Scottsdale, Arizona after spending Christmas with family in Henderson/Las Vegas, Nevada, we were busy finishing our preparations to leave the country on our first cruise on January 3, 2013 as mentioned in yesterday's post. New Year's Eve 2013 in Marloth Park, South Africa at Jabula Lodge with Piet and Hettie. On New Year's Day, we drove to San Diego to stay with our niece and her husband for two nights while we waited to board the ship at the Port of San Diego. In these past three years, we've made little hoopla of New Year's Eve except in 2013 when we attended a party at Jabula Lodge in Marloth Park with our new South African friends, Piet and Hettie whom we'd only met on Christmas Day at the same location. Having never met Piet and Hettie prior to Christmas Day, we shared a table that day when Jabula Lodge became packed and we'd offered to share, making an instant connection with this wonderful couple, friends for life. Last year in 2014, we were still on the Big Island with two weeks remaining until we'd fly to Kauai for four months. Our remaining three family members had traveled the two hour drive to Kona to swim with the manta rays on New Year's Eve and stay overnight. Tom and I stayed in settling into a quiet evening as the year wound down. Our friends, Piet and Hettie with whom we spent Christmas Day and New Year's Eve in 2013. For more photos from that date, please click here. There's no disappointment for us in having another quiet New Year's Eve. Having the opportunity to spend them each year in different parts of the world provides us with all the excitement we need. Down the road, should social activities ensue, we'll certainly participate but, in the interim we're thoroughly content. We'll play a little Gin, enjoy a good meal and perhaps, if the wifi signal is good enough, download a movie to watch after dinner. Yesterday, Susan, the property owner, arrived from another of her homes in Argentina with her significant other and stopped by in the late afternoon to say hello. What a delightful woman, who ironically was born in Wisconsin, USA! As a world traveler, a writer, a business woman and an adventurer, it was wonderful to hear her stories of frequent world travel. They were busy with plans for a few days but surely, we'll all get together in our remaining time in Pacific Harbour, now down to a mere four days. Sunday, we'll pack. Monday at 7:45 am our driver arrives to take us to the airport in Nausori for a non-stop flight to Sydney. We're ready to begin a New Year, grateful for the New Years of the past and hopeful for the New Years of the future. May all of our readers have a safe, happy and healthy New Year! Late in the day yesterday on December 31st last year, we spotted these whales. The much anticipated fluke, the tail was the prize. Wonderful! For more details and photos from that date, please click here. Memories come to mind...Readers, thank you for the inspiration! We often encounter unknown flower varieties when we walk in the neighborhood. When we recall our first foray outside the US on January 3, 2013 when we embarked on the classic old-style Celebrity Century, a first cruise for both of us, the level of anticipation and excitement was indescribable. At the time I was a little fearful of heading out to sea on such a big ship. The first few nights I lay awake from the creaking and rolling wondering if something was wrong with the ship. By the time the Century made is way through the Panama Canal with the new locks being built beside it, I felt like an old ship's hand, comfortable and at ease. The pebbly road we walk in the neighborhood. After 11 cruises all fear had long since dissipated as I embraced the wild seas, the rocking and rolling and what became familiar ship sounds both during the day and at night. When we sailed on our first Atlantic crossing in April, 2013 to experience our roughest seas ever, 50 foot (15 meter) waves on the Norwegian Epic, we both wandered about the ship excited and amazed by the rough seas with nary a hint of seasickness while most passengers were tucked away in their cabins on medications and patches for seasickness. The infirmary was packed with ill passengers while we visited with others like us, who enjoyed the excitement and for whatever reasons, don't suffer with seasickness. Many homes are tucked away in the neighborhood, down long driveways, difficult to see beyond the dense vegetation. For three days, the same few of us wandered about the ship thoroughly relishing in the unique experience while the remaining staff members who hadn't become ill helped carry our coffee and beverages to a table. The pools were closed as were many of the activities areas and some restaurants. We all managed to stay busy for the three rough days and nights at sea, watching movies in the rolling theatre, playing cards slipping and sliding on the outdoor tables and dining in the main dining room as our plates and drinks skid across the table if we didn't hang onto them. When it was finally over, the passengers began to quietly exit their cabins, all a little pale from being unable to eat and drink for three days. Within a day of smooth sailing the flurry of activities including drinking, eating and socializing was once again in full force. A wide array of plants and flowers are found in the neighborhood. We treasure these memories, especially when we can look back at our over 1000 archives not only to refresh our memories in our telling of the stories but in seeing those memories in our photos. What a treasure to have this journey documented to this degree! We never stop appreciating our readers for being the catalyst and the inspiration to continue posting day after day. Had it just been a personal travel journal with a collection of photos, we may have made excuses day after day not to write the experiences, both big and small. In our old lives, I seldom wrote anything on the back of a photo describing who, what and where the photos was taken. 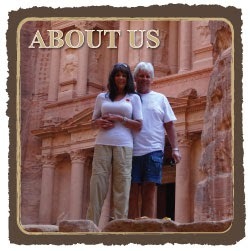 Now, an entire story and multiple photos accompany every memorable experience. The river winds through the area. Knowing 1000's of readers throughout the world have spurred us on day after day is life changing. Those bringing up our site day after day to see what's happening, at times finding only our mindless drivel or gentle ramblings over a sometimes simple life and at other times, finding an exciting memorable experience. No excuses are needed here to avoid posting. The only potential reasons we don't post is due to a total lack of available wifi service or during a lengthy travel days. Even on those days, we attempt to get something uploaded. We've continue to post on sick days even if only to whine about being under the weather. Last night, as we watched Episode 3 of Season 6, the final season of Downton Abbey, tears came to my eyes, not over a sad episode but due to the fact that we'd visited Highclere Castle in August 2014, home of the filming of this fine BBC series and its series end upcoming at Episode 9. With only six more episodes to watch, for us, its the end of an era. Having walked the grounds and the familiar rooms of the castle, we became entrenched in its rich history and exceptional design and the very way it fit into the exceptional series. Please click here for the first of two day's of photos and stories from our visit to Highclere Castle, filming site for Downton Abbey. Please click here for the second of two day's photos and story of the village of Bampton. Last night's episode showed several scenes in the village. The sleepy town of Bampton, England was used in the filming of the series including the interior of the church and a few other building. Having been inside that church, in that village, the memories brought huge smiles across our faces and for me, tears to my eyes, tears of joy for having had the experience. This is the alter inside the church where the Mary and Matthew of Downton Abbey were married. To be able to visit this village, take this and other photos inside of this church and village, shown many times on the series, including last night's episode (spoiler alert), was a memory we'll always treasure, among others in our journey. The long time span between series seasons was due to the show's producers wanting to give the owners of the castle and the villagers time to recover from the last disruption of filming which sends their lives into total upheaval. The notoriety of this series has brought new revenue streams to both the villagers and castle owners along with the commotion which they seem to have appreciated and enjoyed. Now, as we countdown to departing Fiji in five days with more upcoming memorable treasures behind us and more awaiting us, we've kept the TV tuned to a combination of BBC news and Fiji's own channel 18 for Nat Geo Wild with one episode after another of places we've been, wildlife we've seen up close and personal and of course, places we've yet to visit. The river is lined with houses many with docks and boats, able to head out to sea from this waterway. All we have is the moment in which to live. In another moment, it becomes but a memory. Its those moments and memories we treasure whether its a face to face encounter with a crocodile, a visit to a world renowned castle or a warm and unspoken wide grin to one another...its all worthy of a memory! We carry on, hopefully with humility, grace and ease...May you continue to do so along with us. From left to right; Sarah, TJ, me, Tom, (front) Vincent, Jayden, Nik, Tracy and Tammy, a photo we took yesterday of our remaining family members. Tammy, Tracy and Vincent remained in Pahoa for four more days while the others had headed home. For more details, please click here. We'd been warned against purchasing locally caught fish when its often caught close to the shore where bacteria is heavy in the waters from sewage disposal. As a result, we never purchased any fish during the past four months. I'm looking forward to cooking fish once we arrive in New Zealand. It seems like yesterday we arrived in Fiji. By our perception, four months in Fiji passed in the blink of an eye. When we mention we'll be in the US in less than 17 months, having fulfilled our goals for seeing many areas of the South Pacific it sounds far away. To us, it will transpire in no time at all. All we have to do is look back 17 months ago to recall how quickly time has passed when we spent two weeks in Paris and then two more weeks in London. Those memories are forefront in our minds, as if it was only a few months ago. Dried leaves used for weaving rugs and other items. It seems as if once we embarked on this journey time seemed to fly more quickly. In our old lives when we took an occasional vacation (few, due to my then poor health), the days passed so quickly that all of a sudden it was Wednesday, the middle of a one week trip. As hard as one may attempt to live in the moment and enjoy each remaining day of a "vacation" the looming departure date is hard to ignore. Most travelers have experienced that sensation while on vacation/holiday, especially when having a fabulous time. Pineapple is a commonly grown fruit in Fiji, often available for the taking in many areas. In the farmers market, they sell to visitors, not many locals. In our lifestyle of perpetual travel we seldom feel a sense of dread in leaving a country (although I struggled leaving South Africa). We don't experience angst in anticipation of leaving, only a bit of discomfort over lengthy travel days where flying and waiting time exceeds eight or ten hours. Anything less, is a breeze. These days, we don't think about packing until one or two days before departure although I may start folding and organizing three of four days earlier always in an attempt to lighten the load for upcoming flights. Pineapple leaves stripped from the pineapples are used for weaving and decorations. Flying from Fiji's Nausori Airport in Suva next Monday will definitely result in paying excess baggage fees. With our luggage containing everything we own each bag is heavier than normally allowed. Most airlines allow one checked bag each. We have an extra third bag containing supplies, shoes, toiletries and first aid. Each airline has its own varying weight restrictions and we've found we've paid more on multiple flights in this part of the world than in many others. Unquestionably, our dislike of flying and its associated commotion, delays, tight quarters and baggage fees has been instrumental in our preferring cruising to flying whenever possible. Cruising doesn't include baggage fees, includes housing and meals and is an easy way to travel to many parts of the world in one fell swoop. Rows upon rows of pineapples for sale for one third the cost as in Hawaii. After 11 cruises in the past three years, we've learned to avoid crowds and long queues associated with hundreds of people trying to gain access to tourist venues and getting on and off cruise-arranged buses. We prefer to be included in small groups tours arranged by people Tom meets on the CruiseCritic website who are looking for participants in six or eight person charters. While on the ship, we tend to be observers of various activities rather than participants, organize meal and pool times when the crowds are lighter, instead spending time in small groups with people we meet. The kid's face is priceless as he checks out the big slices of locally grown watermelon at the farmers market in Suva. Hope his dad made a purchase. Of course, we'll spend the better part of each morning preparing the day's post, often sitting in a spot where we can easily chat with those around us, making the process all the more entertaining. Need I say, we're looking forward to being aboard the cruise a week from today. No doubt, if available, Tom will participate in the daily "Shed," an Australian inspired "men only" get together where they discuss "guy things." In some countries this gender specific gathering may be frowned upon as "sexist." But, in Australia, not the case. Women are not welcomed and no one seems to care. I'm thrilled when he's has the opportunity for these two hours without me able to interact with other guys. He says he enjoys it not as a means of being away from me for a few hours but for the camaraderie. How sweet, he is! Regardless of the reasons, I always find others to chat with in his absence, often other women who's partner is also attending the "Shed." We stopped at a meat market in Suva but didn't make a purchase when we had the long drive back to Pacific Harbour and had yet to grocery shop. Today, we're off to the Arts Village for a few final groceries to fill in the blanks for our remaining six meals, five of which we plan to have at home. With careful planning, as always, we'll be leaving behind only a few condiments and spices. The sun is trying to peek out of an almost entirely cloud covered sky. Whether today will be day 12 of rain is yet to be seen. The hanging clothes from laundry of three days ago hasn't fully dried. The cool weather of New Zealand, where we'll arrive on January 19th after the cruise, sounds rather appealing at this point. Have a fabulous day as this holiday season winds down. A whale's back, spotted yesterday. I took this whale photo from the lanai at one of the rental houses on the Big Island. On this day, one year ago, family began leaving the islands to head back to the mainland. At this point, we had no idea when we'd see everyone again but now its on the itinerary as mentioned above. For more photos, please click here. The guard at the gate to the Government Building in Suva, the capital of Fiji. Since arriving in Pacific Harbour its been cloudy and rainy for no less than 17 out of 21 days. While in Savusavu, we experienced a similar amounts of rain occurring almost every day during the three month stay. As positive as we attempt to be about conditions where we're living at any given time, it would be ridiculous to say we're not looking forward to the cool sunny climate of New Zealand, definitely not in the tropical climate category. At this point, its hard to believe our four months in Fiji is coming to an end. Overall, we've enjoyed Fiji, mainly for its friendly locals, beautiful surroundings, colorful vegetation, sparkling sea and some of the finest organic produce, grass fed meats and free range chicken on the planet, all at affordable prices. Recently, dining out on several occasions has been enjoyable with many options befitting my diet which wasn't the case in either Savusavu or Trinity Beach when most menu items included starches, sauces and sugar. Distant view of the Government Building in Suva. Fiji is truly an affordable place to visit for the long term when staying in a vacation property and perhaps at different times of the year, it rains considerably less, making it all the more ideal vacation/holiday spot during those periods. We remind ourselves that literally everywhere in the world has aspects that may not be ideal to the average traveler or even the long term resident. Years ago, we often discussed how many Minnesotans retired to Arizona and Florida for the great climate. But, after visiting both states and watching weather reports over the years, we've seen and experienced that their winters can be cool with inclement weather. When we first left Minnesota to travel the world, we spent our final two months in Scottsdale, Arizona, a beautiful desert community, a haven for many retirees, making final preparations to leave the US long term. It was warm when we first arrived in Scottsdale in early November, 2012 but quickly became cool requiring we wear jackets most days. We never had an opportunity to use the pool outside our condo door. It was simply too cool. The long fence along the Government Building in Suva. During our Scottsdale trip, we rented a vacation home for a week in Henderson, Nevada for a family gathering over Christmas. There too, it was very cool and we never used the pool in the backyard. On many earlier visits to son Richard in Henderson, Nevada, we recall very cool weather in the winter months. Tom and I easily recall waiting outside a casino after a show for the valet to return our car, freezing while we waited 20 minutes. Where is the ideal year round warm climate? Does it even exist anywhere in the world? If its warm, its usually humid. When its humid, there are usually mosquitoes and a wide variety of insects and...lots of rain. The more we travel the more we accept these realities, especially when we've spent such a huge portion of our travels living in a tropical environment. Over the past 12 months, we've lived on four islands of Hawaii, Trinity Beach, Australia and Fiji, all considered tropical climates, all of which included clouds/rain at least 50% of the time. The top of the President's house in Suva. In the past 12 months, we've only spent 18 days cruising. Although we spend a lot of time discussing and planning cruises, some years we spend little time actually doing so. On other years its much more such as in the upcoming 12 months, beginning on January 5, 2016 during which we'll be sailing on five cruises encompassing 76 days, approximately 21% of the year. Most often, conditions on cruises are highly satisfactory with little inconvenience and adaptation required; no insects, air con comfort throughout the ship, comfortable beds and seating, relatively good food, no shopping or cooking required, no housework and frequently, good enough weather to spend a little time each day lounging by the pool. Sure, we've experienced rough seas on several cruises and a few bouts of "cruise cough" a harsh inevitable reality on some sailings. Once it starts its difficult to avoid, especially when one of us "catches" it and transmits it to the other. The beach is Suva has several seating areas. Illness is a downside of cruising for which we've promised to be even more mindful of in our upcoming cruises. No handshaking, touching and too close proximity to others. Plain and simple. There were a few occasions we excused ourselves as graciously as possible to leave a dinner table when upon being seated near or next to a coughing passenger. This is an awkward must-do. Even so, we've fallen prey to the cough on three or four occasions. We wash our hands no less than 12 times a day but need to increase the frequency and beef up other methods we've implemented over these past 11 cruises. More on that later. Why cruise? Mainly, the opportunity to visit many parts of the world in a short period, the highly pleasing social interactions and the relatively easy living on board a ship continue to provide a tremendous draw for both of us. ANZ National Stadium in Suva mostly used for rugby and football, popular sports in Fiji. As we begin the countdown to departure and the end of 2015, not so much anxious to leave Fiji as opposed to looking forward to the next leg of our journey, we reflect on this past year as being one of considerable enjoyment, personal growth and discovery. With many plans and new countries in the horizon, we hold onto our seats for yet another enriching "ride" in the awe inspiring world in 2016. Family day at the beach park on Christmas Day, posted one year ago today. Although it was raining, Vincent and Miles (not shown in this photo) were more interested in looking for fish in the shallow tide pools than stopping to eat. For more details, please click here. Hummm...prime rib and spice drops. Tasty combination, Mr. Lyman! It proved to be a good day although it was rainy, hot, humid and we were without power. We decided to bring our laptops, an adapter and one set of plug ins so we could recharge our laptops while at the resort, if at all possible. The band was excellent singing many familiar songs. As soon as we walked in the lobby of the Pearl Resort in plenty of time for our 1 pm buffet reservation in the Riviera Restaurant, I scoped out the plug in options finding there were plenty of possibilities. This was my entrée and dessert...delicious seafood. Asking at the front desk if we could sit in the lobby and plug in our equipment after our meal, they happily obliged saying we could use the outlets and stay as long as we'd like. Octopus, a favorite, although rather chewy. The thought of relaxing with power after the upcoming big meal was appealing, especially with the massive doors opening to the bay offered a cooling breeze. The meat station had prime rib, ham and turkey. Tom had all three but I chose only the prime rib. Tom said the ham was great. After checking in for our reservation, I wasn't thrilled with the table selected for us with our name imprinted on a plastic coated card. It was too near the entrance to the dining room, the band and people coming and going out to the deck. It was noisy, making it nearly impossible for Tom to hear a word I said, with his bad hearing made worsened by background noise. Check out the size of those slabs of prime rib and prawns. It was the most tender beef we'd had in months. We decided to make the best of it and kept the selected table when we noticed the only other available table was too tiny for two diners, my camera and our computer bag on the floor. This was my single plate, piled high. I didn't eat the relatively uncooked green beans but found everything else terrific. Immediately after we were seated, I scoped out the buffet for photos and to check my dining options. A white hatted chef was behind the food stations happily pointing to each item I'd be able to eat that didn't include starch, sugars, grains or flour. There were more options than any buffet we've visited since the onset of our travels. I felt like a kid in a candy store! Tom sure enjoyed his first plate and every other plate to come. Back at the table, I suggested Tom get his food first while I stayed behind to watch the camera and laptop bag. In no time at all, he returned with a small plate of meats from the carving table and alas, a large pile of candy spice drops. I couldn't stop laughing. All those wonderful dishes and desserts and he had meat and spice drops! Yum, baby octopus. Those heads are a bit tricky to chew. I ate four of these, less one head. Of course, he went back many times sampling more and more meat and seafood items and eventually a few desserts. But, each time he went back to the buffet he returned with more spice drops. Love that guy! Five plates of food and candy? I didn't say a word, smiling over how well he does at "home" when our daily meals deprive him of many foods he loves and yet, keeps him lean and healthy. I didn't feel the least bit embarrassed when my plate was piled higher than any other diners as they left food stations. However, a single plate was my plan piling everything I could possibly eat to fit on my plate. (I savored almost every morsel leaving only one small octopus head that was particularly chewy and several undercooked green beans, too crunchy to get down). Tom's second dessert plate with caramel and apple pies, brownie and more spice drops. It was a wonderful meal. As it turned out, half of the food on my plate consisted of a variety of fish shells and I wasn't overly full and uncomfortable. When eating only veggies and protein I never seem to get uncomfortably full, nor do I eat until a point of feeling miserable. That's never been my thing nor is it healthy for me when too much protein or vegetables in a single sitting can exacerbate inflammation and raise blood sugar. A portion of the dessert table. Tom must have eaten one of those entire containers of spice drops. Once we finished our meal, we sat quietly at the table for awhile sipping our water (Tom didn't order a cocktail when he doesn't drink alcohol with sweets) while he munched on his spice drops. Notice the yellow pudding to pour over the brownies or whatever else one may choose. Finally, we asked a waitperson to find our server. After 15 minutes, we asked again. Finally after a total of 40 minutes, we managed to see our server who experienced difficulty having us pay when all the other guests were staying at the hotel and had only to sign the slip. Service at this bar and restaurant was certainly less ideal than the impeccable service we'd experienced in the Seduce Restaurant on Tom's birthday. Fiji time. Decorations and imprinted name tag at our table. The bill resolved we headed to a seating area in the lobby, close to outlets while Tom proceeded to set up our laptops enabling us to send more Christmas wishes to family and friends throughout the world. We'd recharge the laptops sharing the plug in back and forth with a plan to head home by 5 pm when hopefully, the power would be back on. Most diners were hotel guests, not outsiders like us. We only lasted until 4 pm. The cushion-less wicker chairs cut into our legs and backs making sitting nearly impossible. We decided to call the taxi and head home although Tom's laptop wasn't yet charged. My was at 98%. If we had no power throughout the evening, at least we could watch a few shows in the dark. Tom wrapped up his meal eating a couple of candy canes. Walking into the house we were thrilled to see the fans whirring. The power was back on. The power also went out twice during the night awakening us both each time, lasting for a few more hours, making sleeping fitful without a fan or the wall AC unit running. Tom didn't have any dinner last night although I had a few items ready in case we were hungry. By 7 pm, I ate a cup of salmon salad while I spotted Tom snacking on a paper napkin filled with spice drops he'd placed in his pocket. I laughed. The deck on the bay at the Pearl. It was a good Christmas Day especially when we had a chance to talk to some of the family on Skype with more today, had a good meal and managed to end the day with electricity. Today, Christmas Day in many parts of the world, we wish everyone a blessed holiday season and New Year. May life bring each you the fulfillment of your goals, dreams and wishes, all filled with love. This was one of our favorite scenery photos taken on the Big island, so clearly illustrating the power of the surf at the houses we rented for the family visit. For more details, please click here.